The following is a list, though not exhaustive, of social events held at the Stacy-Trent. The information is compiled from first-hand sources such as tickets or event programs. December 29, 1926: Trenton Historical Society dinner commemorating the Sesquicentennial of the Two Battles of Trenton. October 30, 1929: Trenton Historical Society banquet commemorating the 250th anniversary of the City of Trenton. December 5, 1930: New Jersey's State Charity Bal Masque. Guests included Acting Governor Arthur N. Pierson, Lt. Col. H. Norman Schwarzkopf, United States Senators Hamilton F. Kean and David Baird, Jr., Colonel Charles A. Lindbergh, former and future Governor Walter E. Edge, and future Governor A. Harry Moore. November 15, 1938: Trenton Chamber of Commerce luncheon honoring General Motors Corporation officials on the occasion of the dedication of the Ternstedt Trenton Division. January 20, 1943: New Jersey Pharmaceutical Association's New Jersey War Conference and Mid-Winter Meeting. 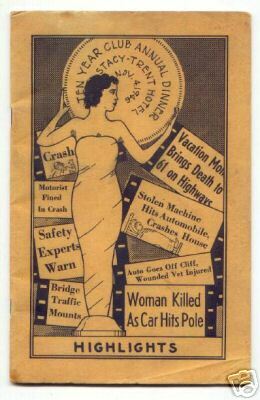 November 4, 1946: New Jersey State Highway Department "Ten Year" Club Annual Dinner. January 23, 1947: New Jersey Dairy Banquet. February 5, 1951: Seventh Annual Banquet Sportwriters and Broadcasters Association of The Inter-State League. April 21, 1951: 7th Annual Old Timers' Nite, Delaware Valley Radio Association. April 19, 1952: 8th Annual Old Timers' Nite Round-up and Banquet, Delaware Valley Radio Association. April 25, 1953: 9th Annual Old Timers' Nite Round-up and Banquet, Delaware Valley Radio Association. January 9, 1954: 6th Annual Banquet, United Racing Club, Incorporated. October 24, 1959: Testimonial Dinner in honor of Harry J, Shepherd, Jr., Grand Master, Independent Order of Odd Fellows, State of New Jersey. January 5, 1960: 2nd Annual Dinner Meeting, Heart of Trenton Businessmen's Association. January 11, 1964: 16th Annual Banquet, United Racing Club, Incorporated.